Palm Sunday is the Sunday before Easter, the last Sunday in Lent. This year, Palm Sunday is observed on Sunday, April 14, 2019 and begins the Christian commemoration of Holy Week. On Palm Sunday, Jesus entered the Holy City of Jerusalem surrounded by a crowd of followers. Today, the palms distributed on this day in many Christian churches signify the branches that were spread in on the road as Jesus approached. Today, Christian churches traditionally hold services on Palm Sunday and leaves of palm are often shaped into crosses to symbolize Jesus' last hours on the cross. These palm fronds are also used in palm weaving which produce beautiful woven symbols from the palms to hang in Christian homes during the year. In churches that observe Ash Wednesday by giving ashes to their members, these palms are burnt for use in this symbolic ceremony the following year. In Eastern Orthodox churches the leaves of the bay or laurel tree are distributed and used in cooking during the year. In many areas there are colorful processions with the palm fronds to commemorate the journey of Christ. In Spain Domingo de Ramos or Palm Sunday signals the beginning of Semana Santa, or Holy Week. Processions and other public celebrations continue until Lunes de Pascua, the Monday after Easter. In some Catholic parishes in the Philippines, a priest rides a horse and is surrounded by the congregation, bearing palms in reenactment of Jesus' triumphal entry. 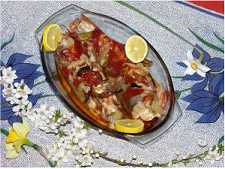 are traditionally served on Palm Sunday. In the Greek tradition, Lenten fast is broken with a fish dinner on Palm Sunday featuring bakaliaros or salt cod. In some parts of Italy, homemade fettuccini pasta topped with tomato sauce, bread crumbs and chopped nuts is the customary Palm Sunday dish. In Great Britain, traditional foods served on Palm Sunday include fig pudding because Jesus is said to have eaten figs on his entry into the city of Jerusalem. In Wales, the day is known as Sul y Blodau or Flowering Sunday because of the association with the flowering of the fig tree. Making split pea soup is another tradition still observed in Northern England and Scotland, derived from the ancient practice of wearing a hard pea in the shoe as penance during Lent. In other areas of the UK, pax cakes - along with best wishes for peace and brotherhood - are given out to congregations after Palm Sunday services in a custom said to date back to the 1500's. More modern interpretations of appropriate foods to be eaten on Palm Sunday include hearts of palm featured in salads and side dishes to observe the day. BBC Religion & Ethics - Holy Week & Palm Sunday - Part of a Holy Week overview with a calendar to find out when this year's observance falls, information on the day's symbolism, and traditional Palm Sunday church services. Palm Sunday - Wikipedia - Extensive entry on the day's symbolism, customs, and liturgical observances with color illustrations, related references and resources. Political History of Palm Sunday - How Jesus and the events of Palm Sunday threatened the political status quo and set a collision course with religious and political authorities.